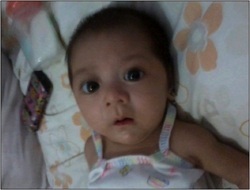 Princess Jamila was born on May 4, 2010 and was diagnosed with neonatal pneumonia with clinical sepsis. She had to take frequent visits to the hospital due to her condition. The primary concern was difficulty of breathing. On August 12 of the same year, her mother started to give her Santé Pure Barley New Zealand. 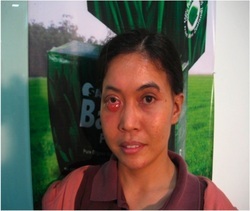 First week she took 2 sachets per day and, after that, 1 sachet divided into 3 per day. Thanks to Santé Pure Barley New Zealand, Princess Jamila was 1) healed of blood infection, 2) her blood count normalized (no longer anemic), 3) she became more active, and 4) can now breathe normally. She is now a very active baby girl. Thanks again to Santé Pure Barley New Zealand! In 2009, Janette was initially diagnosed with nasal polyps. After a CT scan and biopsy of tissue sample, she was diagnosed with SINONASAL UNDIFFERENTIATED CARCINOMA or cancer.After the operation, the lump got bigger. She experienced sudden weight loss in 2010 and so went to PGH to undergo another CT scan. She also underwent radiation therapy. She started taking Santé Barley Pure in July 2010. She started with 2 caps in the morning and 2 caps in the evening before meals. On the 4th day, blood and pus started coming out of her nasal passages. After a week, she took Santé Pure Barley New Zealand powder, one sachet in the morning and one sachet in the evening before meals. After taking our Santé Barley products, the number of radiation treatments was reduced to 25 instead of 40 sessions. Her last CT scan of the neck done at the PGH on October 8, 2010 showed that the cancerous mass had reduced in size from 6.0x5.0x6.5cm to 5.0x4.2x5.5 cm. Thanks to the contribution of our Santé Pure Barley New Zealand for her miraculous recovery! "Nagkaroon ako ng stroke at hypertension. Sumakit and buong katawan ko, naghihina at nahihilo. Sumasakit ang ulo ko. Uminom ako ng Barley Pure 1x a day. Gumaan ang pakiramdam ko, nawala ang pananakit ng batok ko, bumaba ang BP. Hindi na ako stressed out." Diagnosed with goiter and sore throat. "Lagi ako paos. Nanumbalik ang aking boses." "Lumakas ang aking katawan at parang hindi nakakakaramdam ng pagod; nawala ang hindi kanais-nais na amoy ng pagihi ko." Diagnosed with chronic gastritis with intestinal metaplasia; gastric outlet obstruction secondary to chronic peptic ulcer. Can't eat solid foods since 2006, only oatmeal and ensure. Has multiple skin lesions on both hands. Took 2 sachets of barley in the morning and before bedtime. "Nawala ang sakit ng tiyan ko. Nakakakain na ng solid foods; nawala din ang aking skin lesions from both hands. Nawawala ang mga lymph nodes na tumubo sa akng leeg." "Lagi masakit ulo ko, madalas mahilo dahil mababa ang BP ko. Meron po ako hika at masakit ang aking tuhod, di ko mailuhod. Uminom ako ng barley 1 capsule per day. Nawala ang sakit ng tiyan ko. Hindi na sumasakit ang tuhod ko at nailuluhod ko na ito. Nawala po ang hika ko at hindi na din ako madaling mapagod. Hindi na din sumasakit ang ulo ko gaya ng dati." Suffered a stroke and was bedridden. Took barley powder 2x a day. "Lumakas siya, gumanda ang kulay niya, bumaba ang BP at lumakas ang kain." Hindi halos makalakad at laging inuubo. Masakit ang balakang hanggang talampakan. Uminom ng barley 1x a day. Sumigla ang aking katawan at nakakalakad na ng maayos. Nawala din ang ubo at sakit ng balakang. See how powerful our Pure Barley? Even Stage 4 Cancer is been cured! We are not only on making money, but we are also into Health!